October has been a busy month for telecoms analysts. There’s been a lot more buzz about Global Crossing, which has announced the purchases of Impsat and Fibernet and is itself the target of some M&A buzz. Taiwanese WiFi and MiMAx leaders D-Link are also continuing their rise, and are posed to enter the top 25 firms about which telecoms analysts are writing the most. Those two firms are spotlighted by this month’s Lighthouse Telecoms Index. Lighthouse’s analyst index tracks analyst research about hundreds of the world’s leading telecoms and technology providers. Of course where there are winners, there must also be losers. Analysts are losing interest the most in Mobilkom, the international brand of Telekom Austria, despite its ambitious plans in Serbia, Slovakia and Slovakia — consolidating its leadership in southeastern Europe. It reflects a general trend this year in which a number of European telecom brands are being overtaken by Asian and US firms. The firms shown in the chart above are those which have risen or fallen the most places in October’s ranking. Lighthouse’s subscribers get much more information, but you can get a flavour for free. 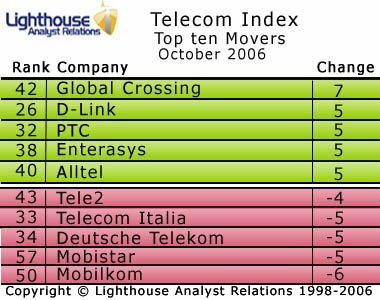 If you wish to be sent the top 25 firms in Telecoms Index each month, email us at analysts at lighthousear dot com. You can also read how we do our Analyst Index rankings. You will then be added to our distribution list.